Read on for the nitty gritty about travelling in Kenya. Includes information on getting to Kenya, vaccination requirements, visas and all importantly the weather and when to go. Kenya has international airports in Nairobi (Nairobi Jomo Kenyatta NBO) and Mombassa (Mombasa Moi International MBA) which are around 8 hours flying time from the UK. British Airways and Kenya Airways fly regular direct services to Nairobi. Return tickets usually range from £550 to £850 depending on when you are travelling. If you are willing to put up with the inconvenience then cheaper tickets can usually be purchased with a stop from Qatar Airways, Ethiopian and Emirates. Nairobi Jomo Kenyatta airport is a ½ hr 16km drive from Nairobi City Centre, but traffic is often very bad. There is a good internal flight network whose hub is at Nairobi Wilson Airport. The network mainly serves destinations on the coast and the main national parks. Most safaris and treks include transport in a minibus or 4wd vehicle. Kenya is subject to 2 rainy seasons, and a busy peak tourist season, but in reality is a year round destination. 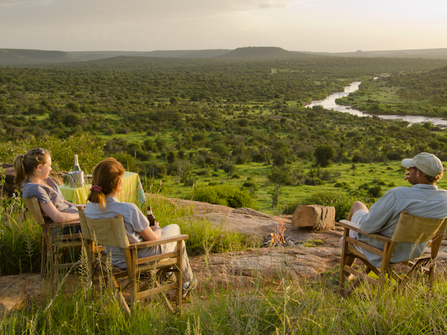 Most people visit during the summer months of July and August, when the weather is dry and the Maasai Mara is teeming with the Wildebeest migration. -July and August are peak season with Europeans and Americans making the most of their summer holidays, so expect crowds. However they also fall right after the long rains, so expect lots of lush green. -September and October play host to the short rains. Rain tends to fall for only a couple of hours in the afternoon or morning, so you shouldn’t let it stop you. -November, December, January, February and the first half of March are the dry season. Expect hot weather and quiet parks. -Second half of March, April, May and June plays host to the long rains. During this period it tends to rain through the night and into the morning. It is usually possible to get a dry spell between 10am and 2pm for getting out on safari. Visas are required for most nationalities (including UK citizens, Americans, Canadians, Austalians and Europeans) and are purchased on arrival at Jomo Kenyatta International Airport in Nairobi for £20 (single entry). Kenyan currency is the Kenyan Shilling. There are ATMs at the airport and in most major Cities.